This year the American Heart Association's Go Red For Women Movement teamed up with Warner Brothers and the Ad Council on a new public service announcement encouraging audiences to Go Red. 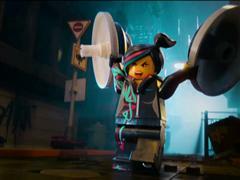 Created pro bono by Warner Bros, the PSA features scenes and characters from the upcoming The LEGO Movie. Voiced by Emmy-nominated actress Elizabeth Banks, the film character Wyldstyle empowers women, asking them to "stand stronger, shout louder and demand change" to put an end to heart disease.